We provide training courses in ArcGIS, MapInfo Professional and QGIS software. Our self-paced learning is comprehensive, flexible and affordable and we provide a full range of training for all levels of GIS user. This video tells you about GIS247. When you watch don’t forget to turn your sound on whilst the video settings allows you to control the visibility of the closed captions. We provide a range of training for all levels of GIS user: beginners, intermediate users, advanced users and those who wish to use specialist software or functions. As we don’t all learn at the same speed, the flexibility of our e-learning means you can follow the training at a pace that suits you. You can also repeat any aspect until you are entirely comfortable with what you have learnt. Each training course covers a fully rounded set of topics taking you to a specific user level. Courses are designed to follow on from each other so if you are a beginner you can work your way through the courses to the level you want – even an expert! If you’re not a beginner you have the ability to choose any course that suits you, at any level. It’s always useful to take a look at the different training that’s available as we have lots of useful tips and tricks to share. Technical modules are short and address a specific function. Even experienced users forget the details of a specific function sometimes. That’s why our technical modules are so useful. You can simply look up the video and watch it. Ideal to refresh your memory. GIS Essentials are educational presentations which outline key concepts that all GIS users should understand. Do you know the difference between raster and vector? Or how projection fits in? E-learning has lots of great advantages to learning effectively. We also support you every step of the way with our Learning Management System (LMS). 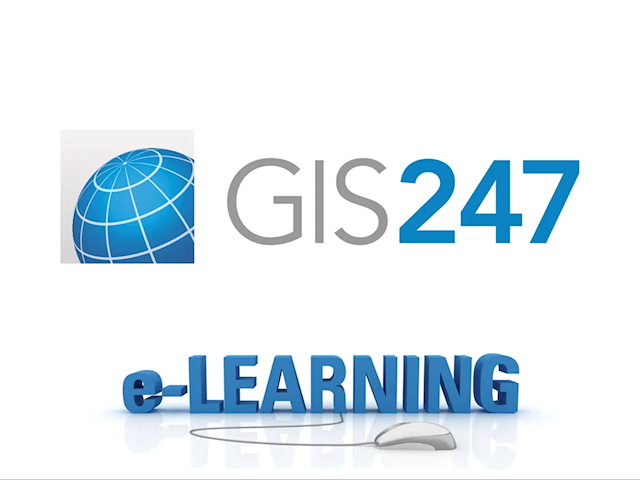 One aspect of our LMS is your My GIS247 home page. We use this to keep track of where you got to with your training - so it’s really easy for you to pick up where you left off. We also provide an array of additional resources such as timing information, course guidance, closed captions and a search function. We like to speak to you as well. Out team of experts is happy to answer any question you have. We think our e-learning approach is really good and really effective! Don’t just take our word for it. Our training is accredited by a number of different professional bodies, including the GIS Certification Institute, The Royal Geographical Society and the Association of Geographic Information. We also offer our own assessment programme to help ensure that you learn effectively. We really want to help you learn so we do this for free as part of your training licence. Our licence structure is flexible. This means that our e-learning is great for large groups of users but it great for small groups too. It’s also ideal if you want training just for yourself.